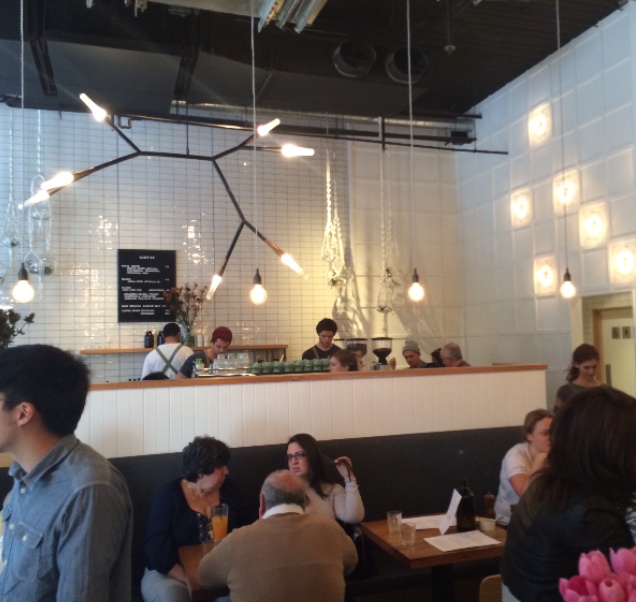 Two birds one stone is a café in South Yarra with a super inspiring menu. 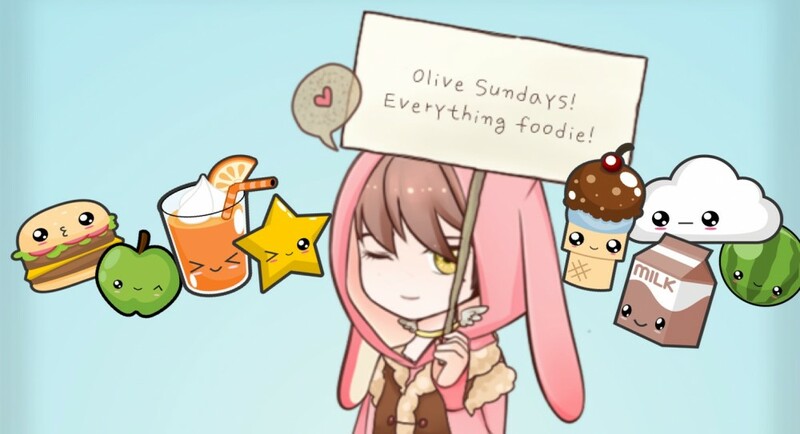 They use good quality fresh ingredients, which make all the difference. The meals are delicious and you can tell someone has put their heart and soul into the food because every dish was well balanced and full of flavour, not to mention absolutely delicious. The food was memorable and the staff were friendly. 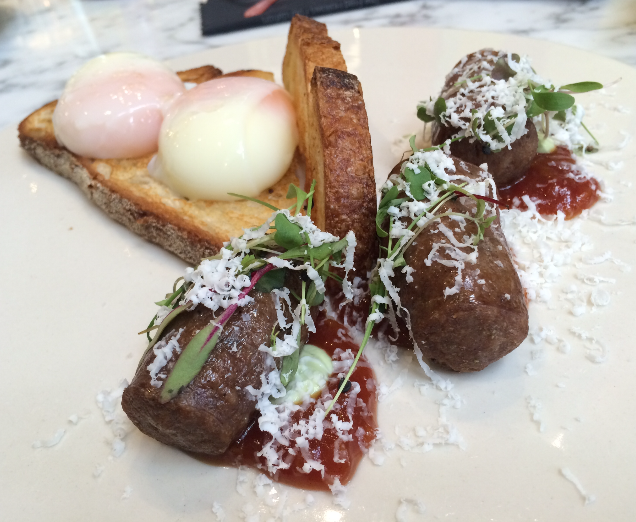 A perfect place for breakfast or lunch or kill two birds with one stone and go for the double whammy…brunch. 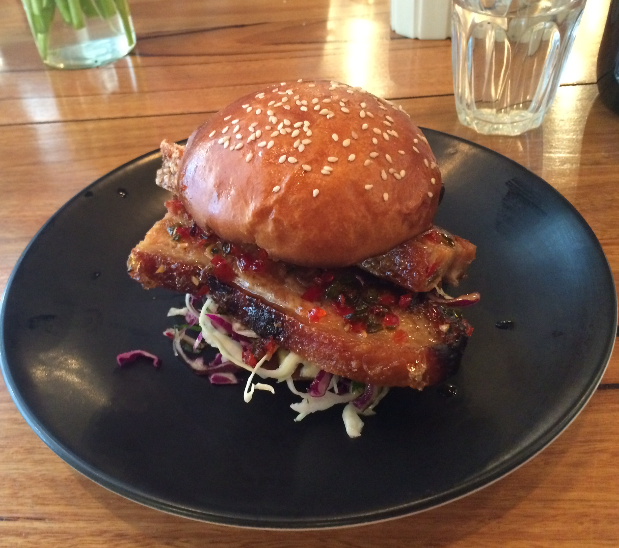 We ordered the crispy pork belly w asian slaw and chilli caramel on a brioche bun. Oh. Em. Gee. This is by far the best pork belly burger on earth. 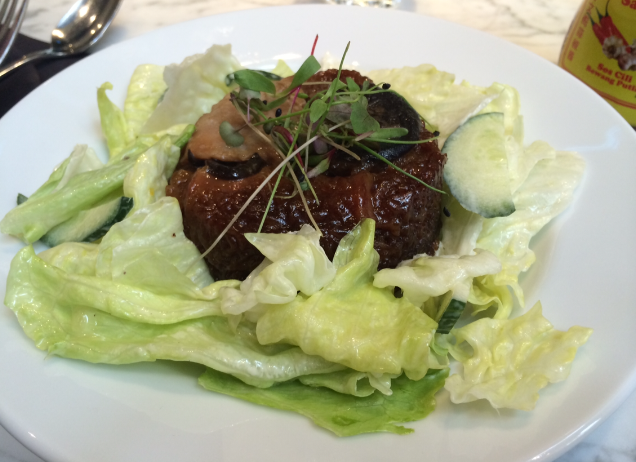 The crackling was crispy and the pork was melt-in-your-mouth soft…amazing! It was full of flavour, it was sticky, it was sweet, it was insanely delicious. This in combination with the toasted buttery brioche bun and the fresh asian slaw was a perfect ten for me. Plus it’s not high on the chilli side of things for those who don’t like the heat and prefer the sweet (see what I did there). It was so so yum! Someone sitting across from me ordered one too. So I was eating my pork belly burger, whilst salivating over their pork belly burger, and thinking of ordering another pork belly burger all at the same time. Whoa talk about multi-tasking. 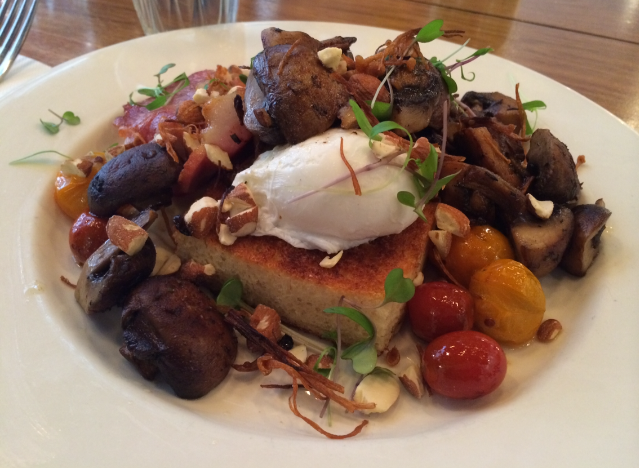 We also ordered the sauteed pine mushrooms on brioche w trussed cherry tomatoes, goats cheese cream, roasted almonds and two poached eggs. And I added bacon what? It just goes with everything. The mushrooms were something else. The pine mushrooms were big and plump and juicy and delicious. There was also little bunches of enoki mushrooms sautéed. They were really good. I could have just had the mushrooms on their own and been happy but it got better. 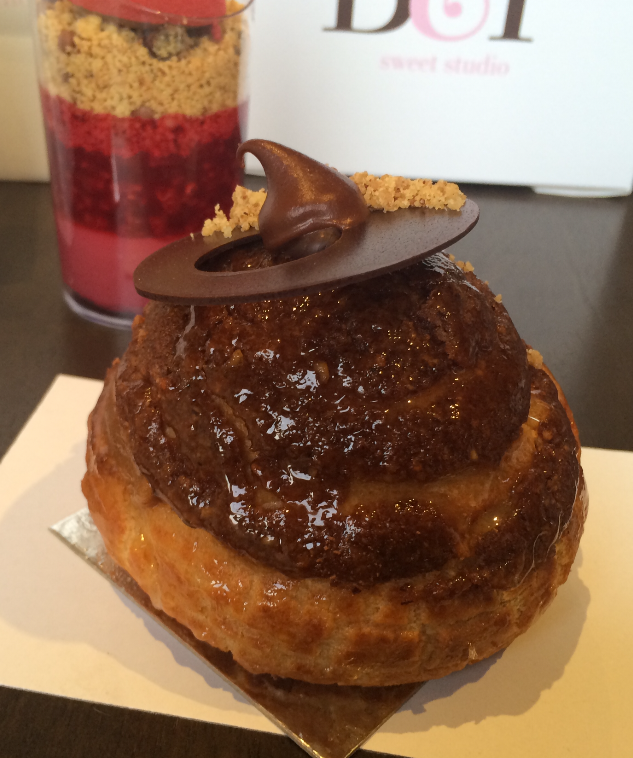 They sat on top of a piece of toasted brioche. I’m pretty sure they said they make their own in-house brioche. It was absolutely superb. I could eat it everyday. It’s makes everything so much better. It’s light and buttery and toasty crunchy. Then there were the truss cherry tomatoes. Some were red, some were yellow and all of them were deliciously sweet. The goats cheese cream was delish, the almonds added crunch, the poached eggs were cooked perfectly and the addition of bacon was a good idea. It had a perfect balance of flavours and textures. Every mouthful was different and I was impressed with how yummy it was. 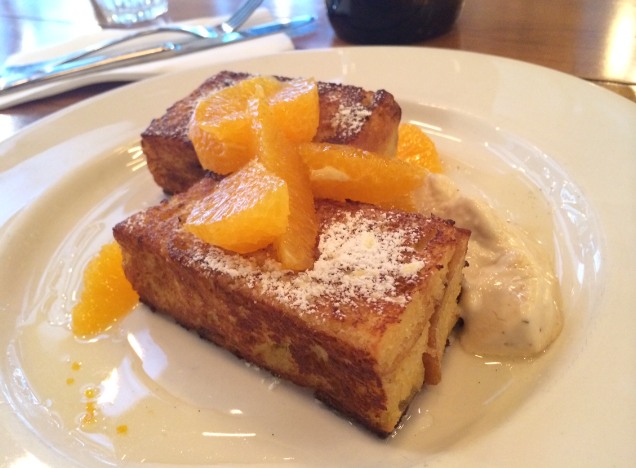 For a sweet treat we ordered the twice-cooked marmalade french toast w oranges and vanilla panna cotta. Oh it was good. They used that delightful brioche I mentioned earlier but this time it was soft and pudding like. It was like French toast meets bread and butter pudding with fresh orange segments and a side of creamy vanilla panna cotta. It was divine. I really enjoyed it. I can’t wait to go back and try everything else on the menu because everything we ate was exceptional. Our waitress was really sweet and thank goodness she suggested the chilli caramel pork belly because it really was something special. The place was open and had lots of sunlight, which was nice. And it had an industrial feel with contemporary design lighting going on which was really cool. I love lamp. 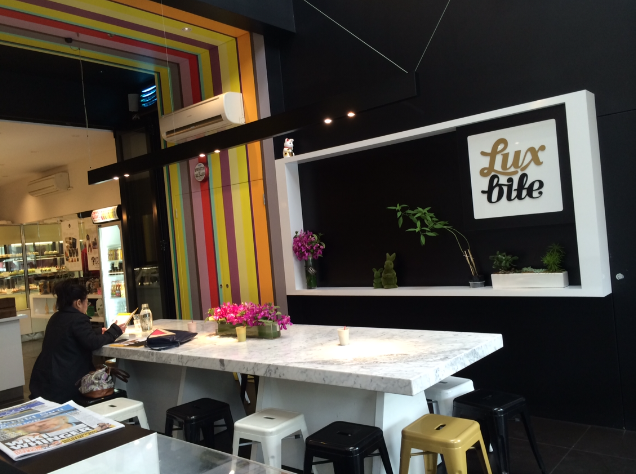 The food was outstanding, the décor had some interesting pieces and the staff were all really lovely. I heart Two Birds One Stone! 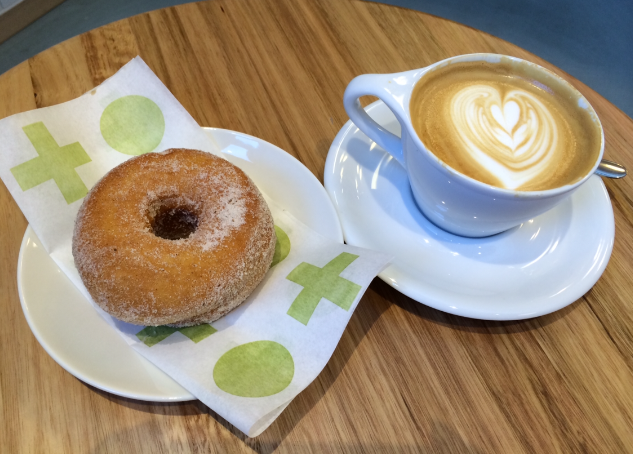 Short stop make sensational donuts and a good coffee to go with it. After tireless months of drooling over their instagram pics they have finally opened their store here in Melbourne hooray! 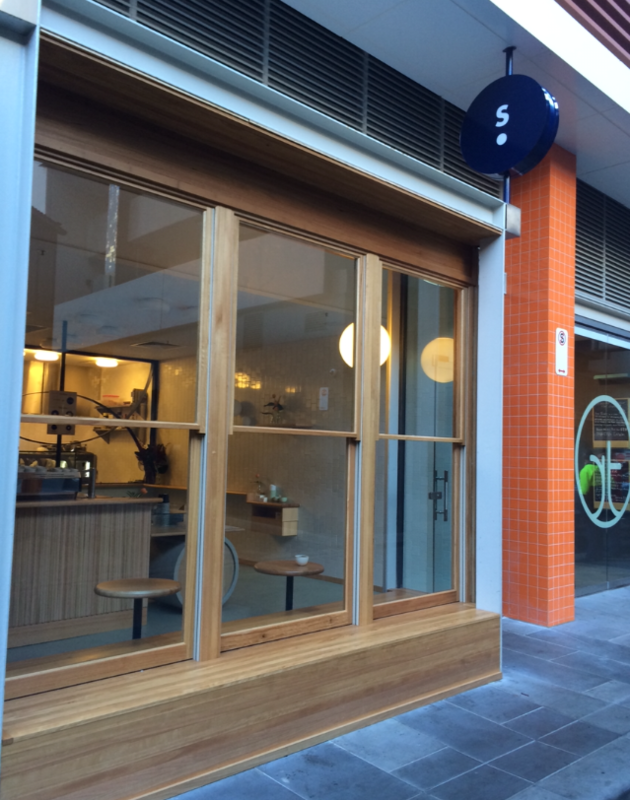 The store is down a side street off Latrobe street. 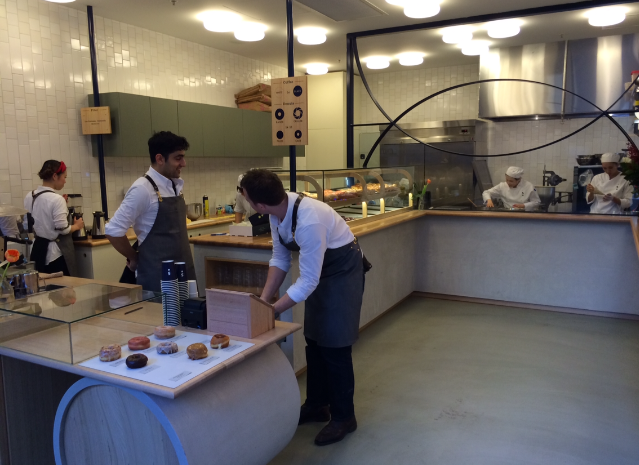 It’s a clean open space and you can see the staff baking and glazing the fresh donuts right in front of you. There was a sign with symbols indicating a simple and uncomplicated menu. Coffee: white or black, and Donuts: raised, cruller, filled or cake. They only serve coffee and donuts but boy do they do them well. The banana, hazelnut chocolate was my favourite. It was like banana bread in the form of a donut. The texture was cakey, a cake-donut yum! What a delicious surprise. 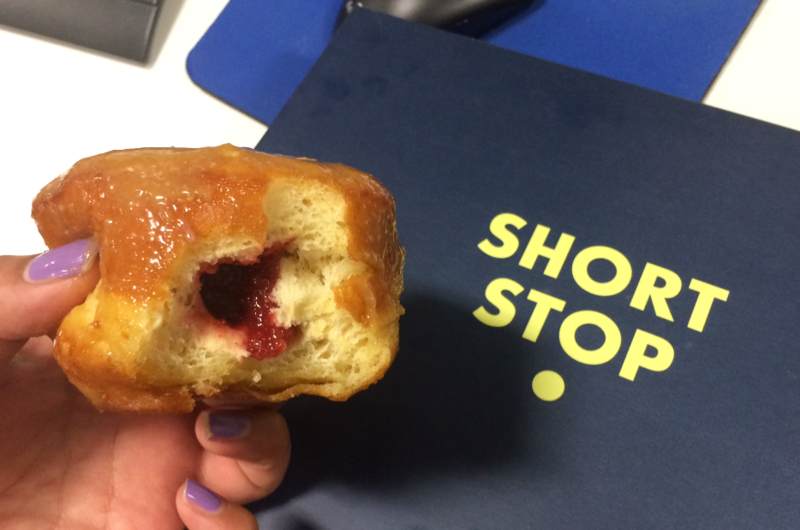 Short Stop Coffee & Donuts – Ooozing banana filling yum! It had a fresh banana cream custard oozing out as I bit into it. The hazelnut chocolate was delish. We all know hazelnut chocolate is a hit (umm hello Nutella) and it was a thin layer, which was clever because it didn’t overpower the flavour of banana. 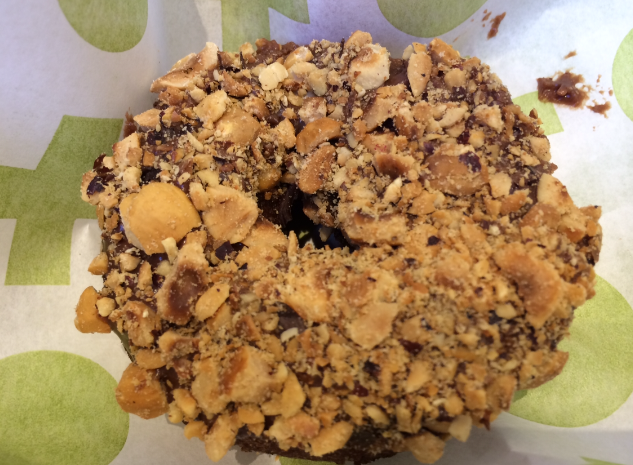 The donut was covered in big chunky roasted hazelnut bits. I totally went bananas over this donut om-nom-nom. 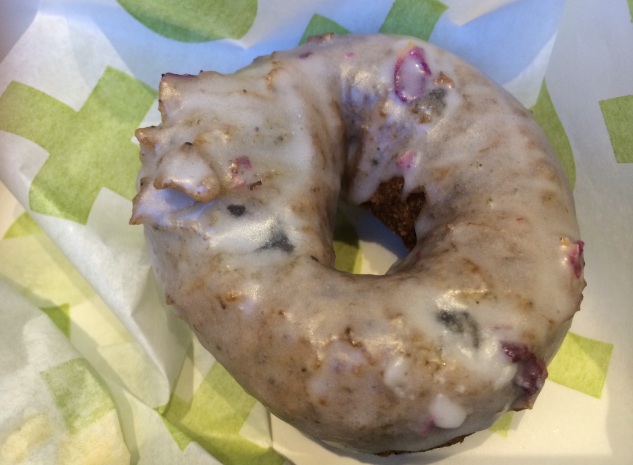 The early grey and rose donut was incredible and different to any donut I’ve ever tasted. 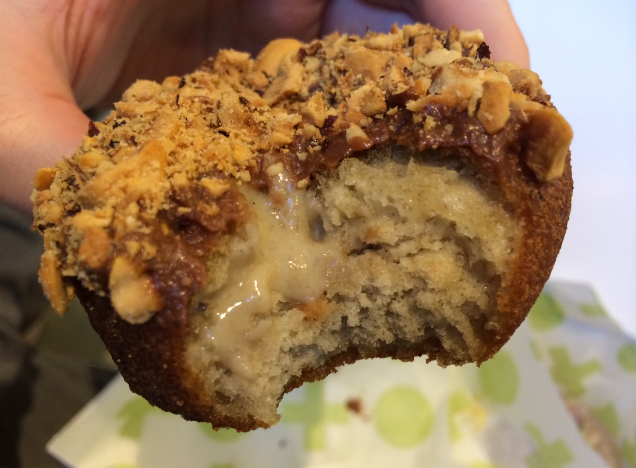 It was a cake donut that had an intense yet delicate flavour. The dough was mixed with earl grey tea and injected with lemon myrtle and was covered in a rose water icing sprinkled with pretty rose petals. How romantic! The bourbon crème brulee donut was popular and understandably so. Excuse me sir someone spiked my donut. The donut was filled with vanilla custardy cream mixed with a good ol’ swig of bourbon. 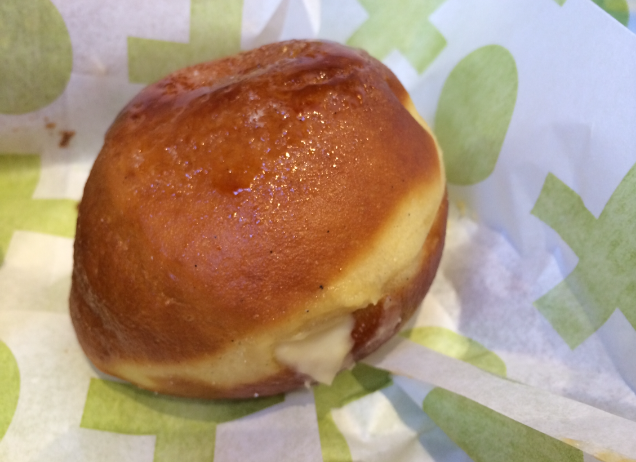 The cream mainly had a strong vanilla flavour and the donut had a gorgeous little bruleed top. So adorable. The p b and j was delish. It tasted just like a peanut butter and jam sandwich. It was covered in a shiny peanut butter glaze (crunchy of course) with scattered bits of crushed peanut and filled with a fresh raspberry jam. Yum! 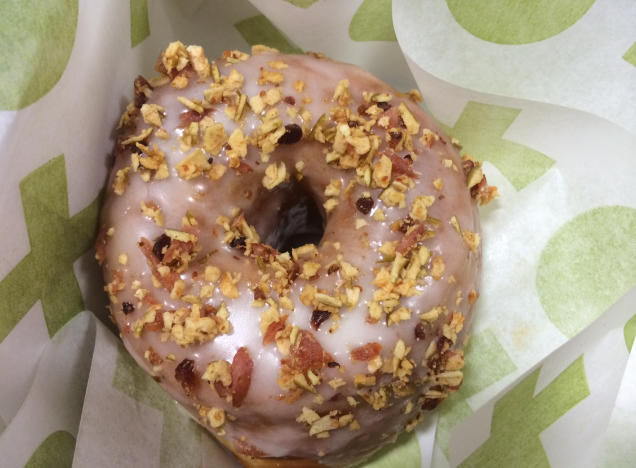 The apple bacon honey and thyme raised donut was a taste sensation. If you like the sweet and salty combo this one is for you. It was covered in honey and thyme glaze then it had the sweetness from the apple pieces and the smokey savoury flavour from the bacon bits. It was nice. 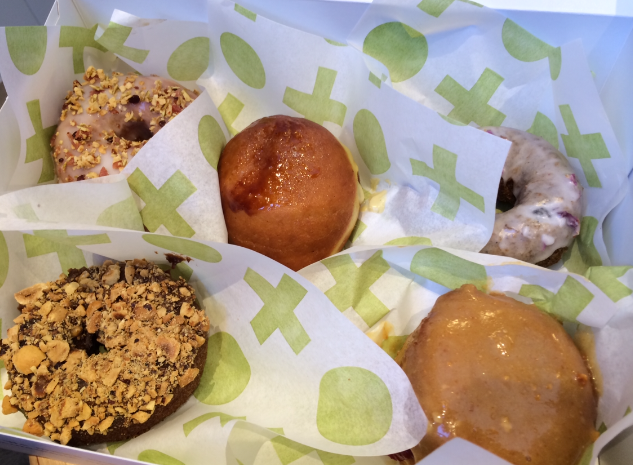 The rhubarb and ginger donut was interesting. It was sweet but not too sweet. The rhubarb and ginger were stewed and made into a delicious pink glaze. The tartness of the rhubarb and the warmth of the ginger go really well together and it had a good balance of flavours. When I think of coffee and a donut, the classic cinnamon doughnut comes to mind. The dough was light and fluffy and had a hint of cardamom. It was a little bit different to the favourite I know and love but still good. It was unfortunate that I bought a fitbit one day before Short Stop opened. A fitbit is a band that tracks your fitness and helps you achieve your fitness goals. Even though banana is a fruit and chocolate has antioxidants, the fitbit was making me feel guilty for eating too many donuts. I shared them with people at work so I wasn’t being a complete piglet but the fitbit was still not impressed. 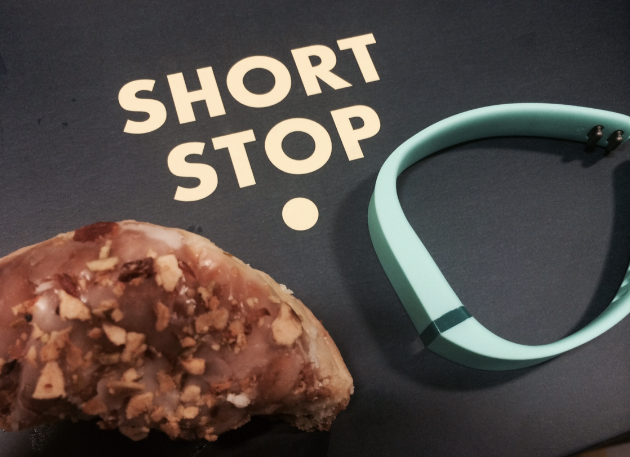 I ended up taking the fitbit off while I ate the donuts to alleviate some of the guilt. I haven’t tried the Australian honey and sea salt cruller because they haven’t been available first thing in the morning sigh but I can’t wait to try it. It’s choux pastry piped into the shape of a donut (cruller) dipped in a honey milk glaze and sprinkled with sea salt. Also I want to try the red velvet donut, which is coloured with beetroot, filled with cream cheese icing and dipped in a dark chocolate glaze. 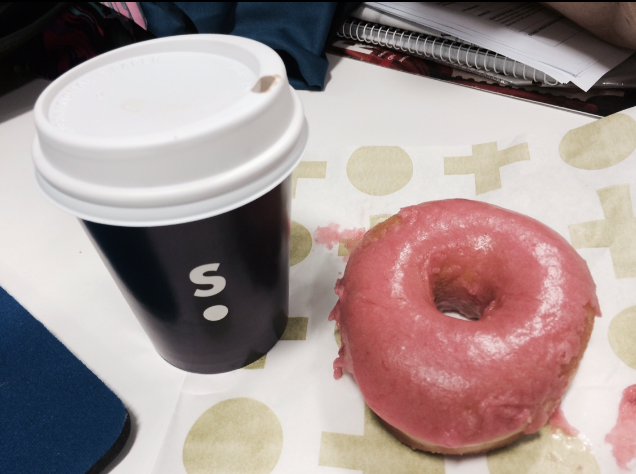 Armed with a donut in one hand and a coffee in the other (with a double espresso) how can you go wrong? Breakfast is served. Good morning indeed. I heart Short Stop Coffee & Donuts! 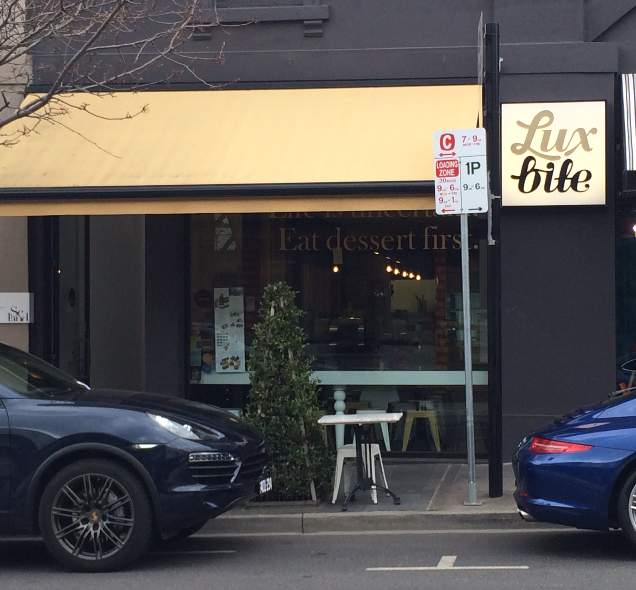 Luxbite is a pastisserie/café on Toorak road in South Yarra. 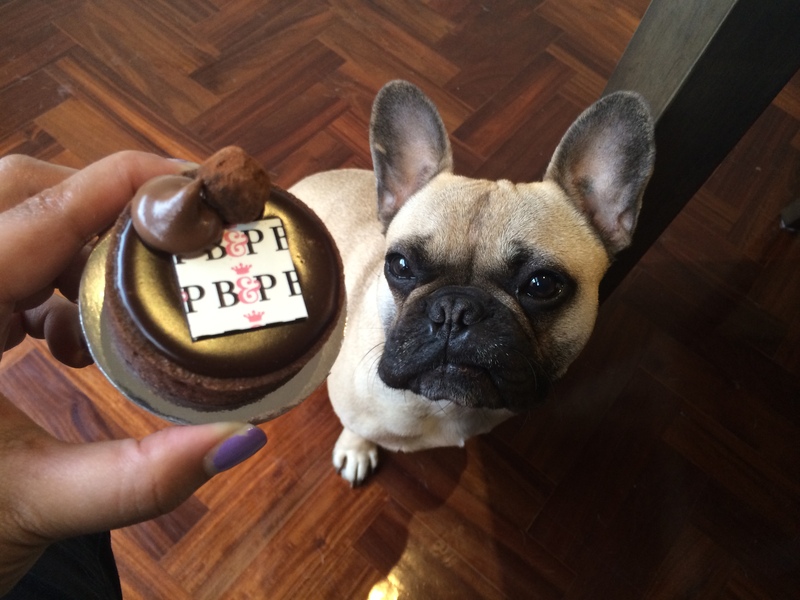 Attention: Yum! Drool ensues. 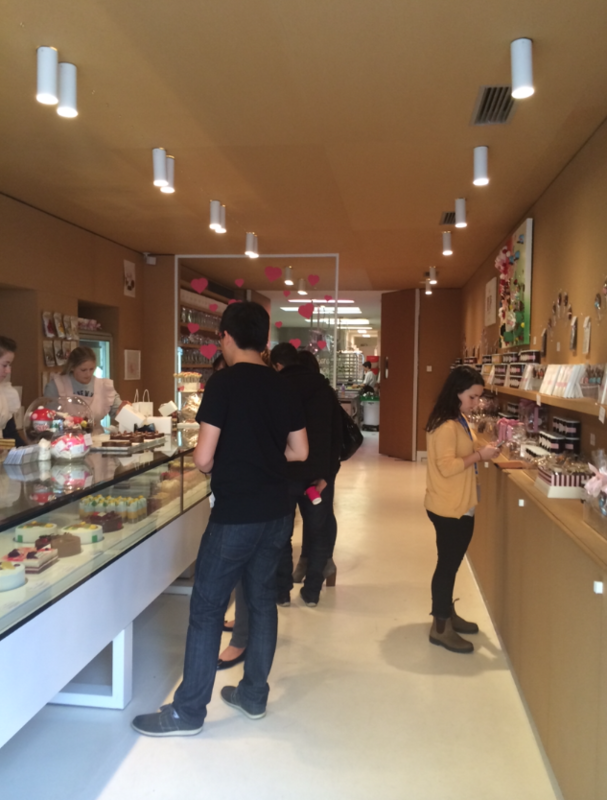 The cakes are inventive, the macarons are scrumptious and they also have tasty savoury dishes. 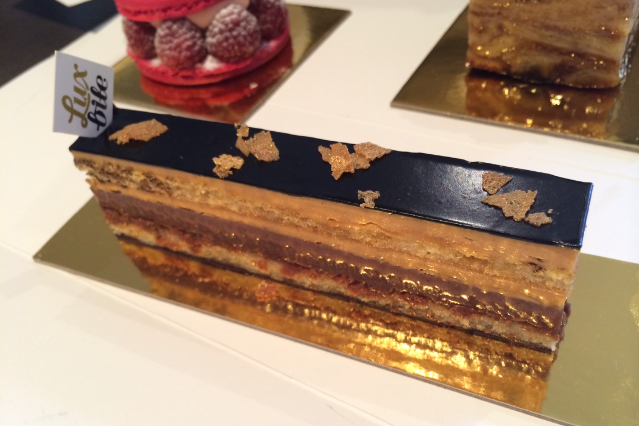 The cakes look stunning and in the taste department they exceed expectations. They had a quote on the window that said “Life is uncertain, eat dessert first.” I really liked that, Ernestine Ulmer was one clever lady. The venue was contemporary and colourful, with lots of light and super high ceilings. There was a grass bunny and some fresh flowers. Really cute. The cake display was impressive. They had a range of full size cakes and minature versions of them too. 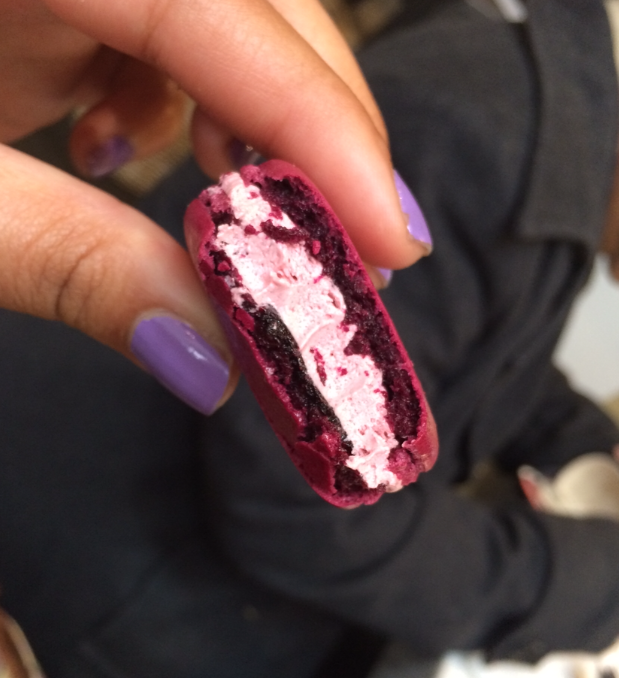 So first things first, I ordered a Ribena lemonade macaron. Eat dessert first? Don’t mind if I do. It was delicious. For me Ribena brings back childhood memories and they nailed the flavour. The vanilla crème brulee macaron is really good too. They have some cool macaron flavour combos like lemon, ginger & pineapple, passionfruit & kaffir lime leaf, green tea pistachio and bamboo oolong tea. I ordered the salted caramel hot chocolate. 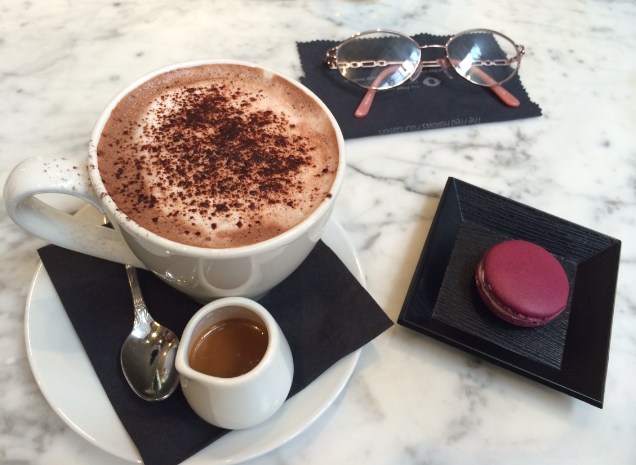 The hot chocolate came with the salted caramel in a little pot so you could add a lot or as little as you like. I made the mistake of tasting the salted caramel on it’s own. It was delicious. I ended up eating most of the caramel and drinking the hot choc without the caramel. Both were good individually so I’m sure they would be good together. Turns out you can buy jars of the salted caramel to take home. Excellent! For lunch we ordered the lamb mint and rosemary sausage, which were juicy and went well with the tomato relish, avocado and feta. The 60/60 eggs were perfect and the toast was really thin which was good because I didn’t want to fill up on bread when I had forecasted lots of cake eating in the near future. We also got the steamed sticky rice w ginger marinated chicken and shitake mushroom on flaky pastry. This was yum and flavoursome and the fresh lettuce and cucumber lightened the dish. It came with Malaysian chilli sauce, which had quite a bite. 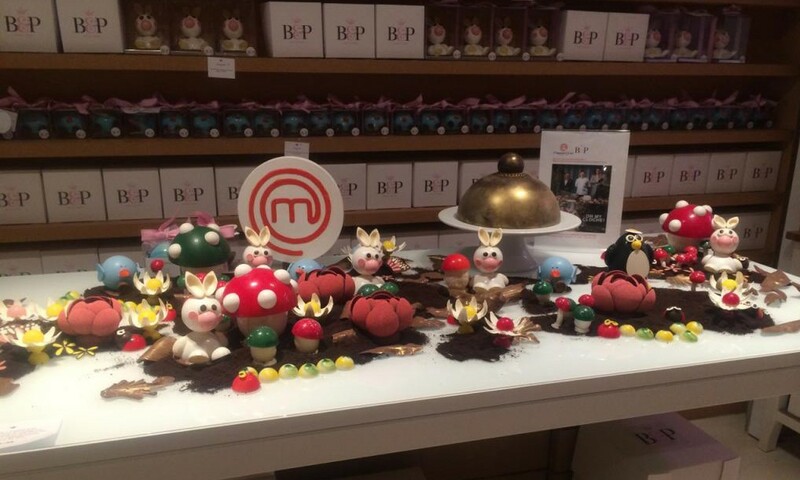 We tried the famous lolly bag cake that featured as one of the challenges on Masterchef. It tasted just like a lolly bag. For realsies! It had banana lolly Joconde (almond sponge cake), freckles crunch, mandarin jaffa ganache, musk mallow, spearmint leaf buttercream, topped with a Redskins glaze. This cake is extraordinary! It’s creative, inspiring and imaginative. A single mouthful takes you back to when you were a kid. The ever so familiar flavours are faultless. 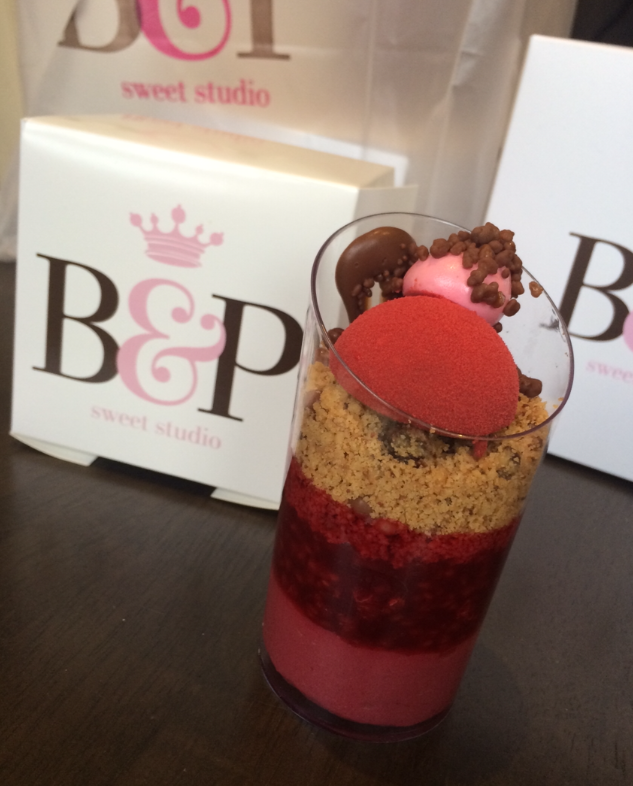 The combination has a perfect balance and it’s not too sweet. It takes you to a happy place. What a wonderful cake. Now I’m curious to eat a redskin, spearmint leaf lolly, banana lolly, jaffa and a chocolate freckle at the same time to see if it tastes nice. I’ll report back later with my findings. 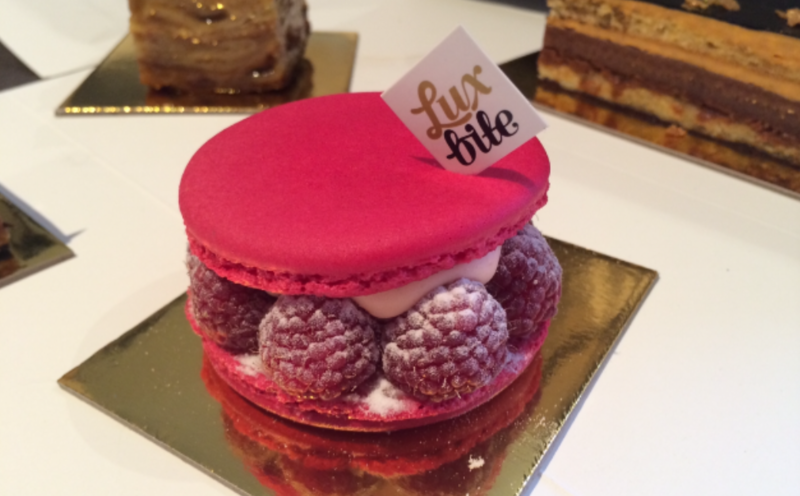 The endless love was a big macaron w lychee ganache, rose cream, lychee and fresh raspberry. It was spectacular! It looked so pretty I didn’t want to eat it. 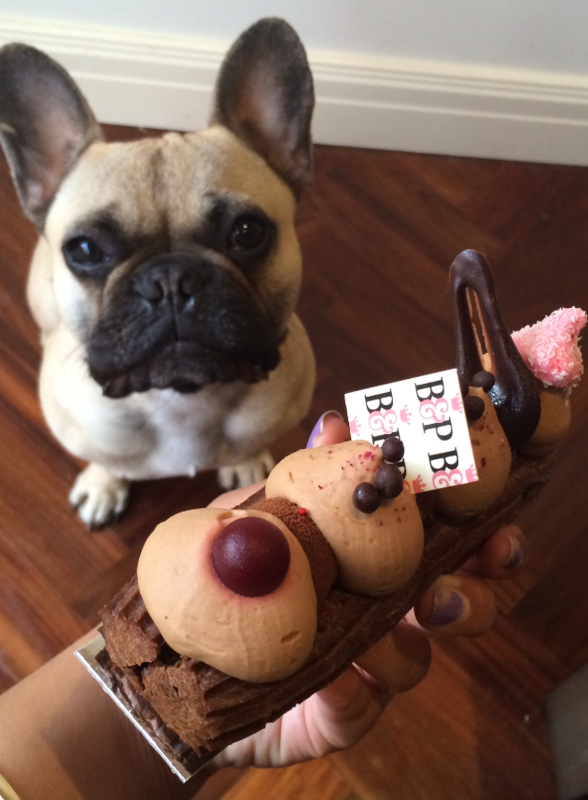 This dessert took macarons to another level. It was delicate and delcious. Max was mesmerised by it’s beauty. 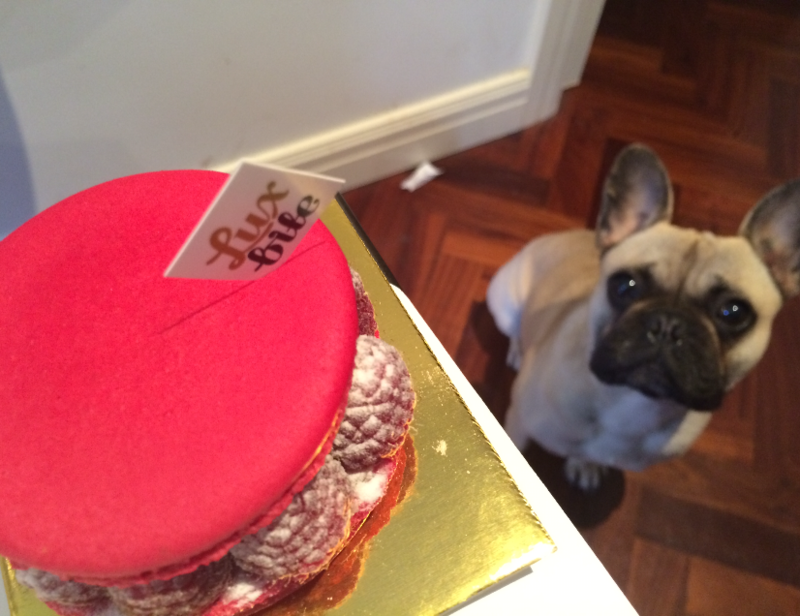 He had never seen such a macaron. The banoffee was a fine slither of deliciousness. This sweet, salty, creamy crunch sponge was delicious. 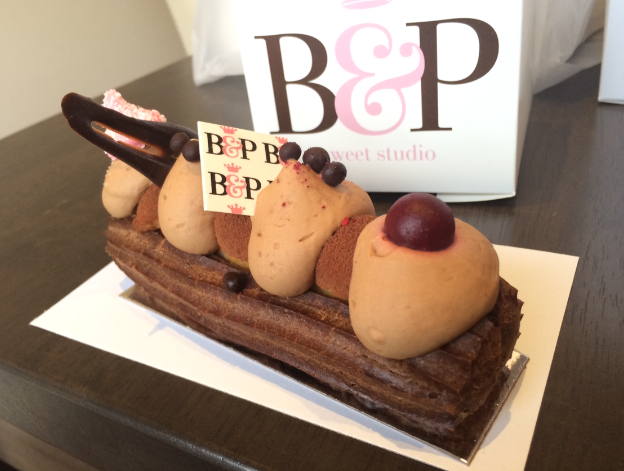 It had a hazelnut sponge, banana ganache (fresh banana flavour yum! 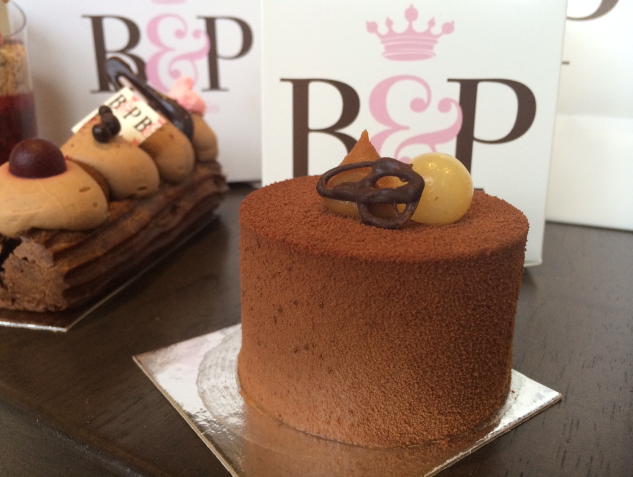 ), Sichuan pepper chocolate crunch and salted toffee buttercream. 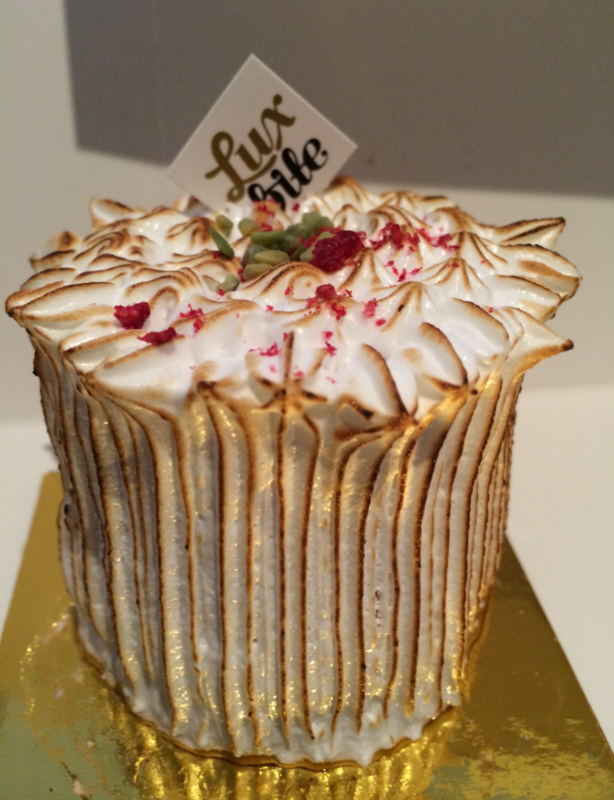 We ordered the meringue monster, which is Luxbite’s signature cake. You can get the full size cake but the mini ones are just adorable. This gorgeous little cake really looked amazing. The meringue looks like it has a striped pattern with little peaks at the top. It’s incredible and truly a little masterpiece. And oh my it was delicious. 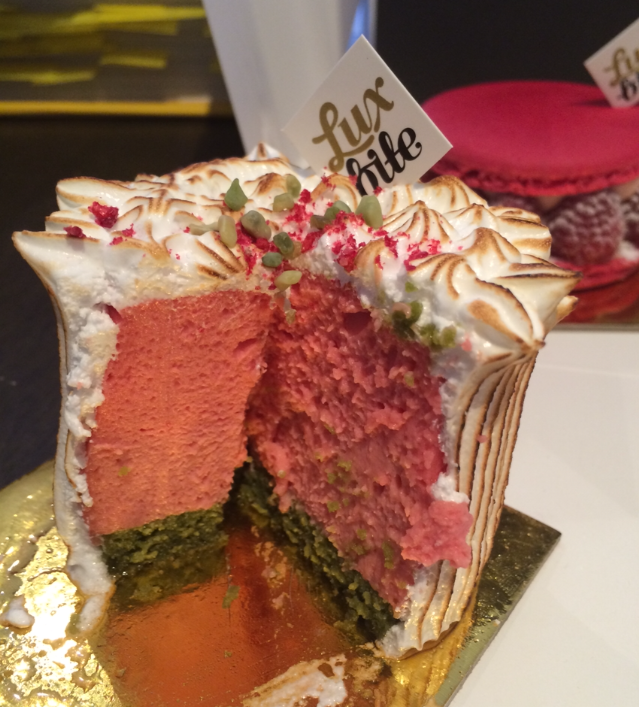 It had green tea sponge, pistachio, watermelon yoghurt, sour strawberry mousse covered in meringue. The combo of flavours was outstanding. Yum! Yum! Yum! The bread and butter pudding was not your everyday b n b pud. It tasted like the classic home favourite with a twist. 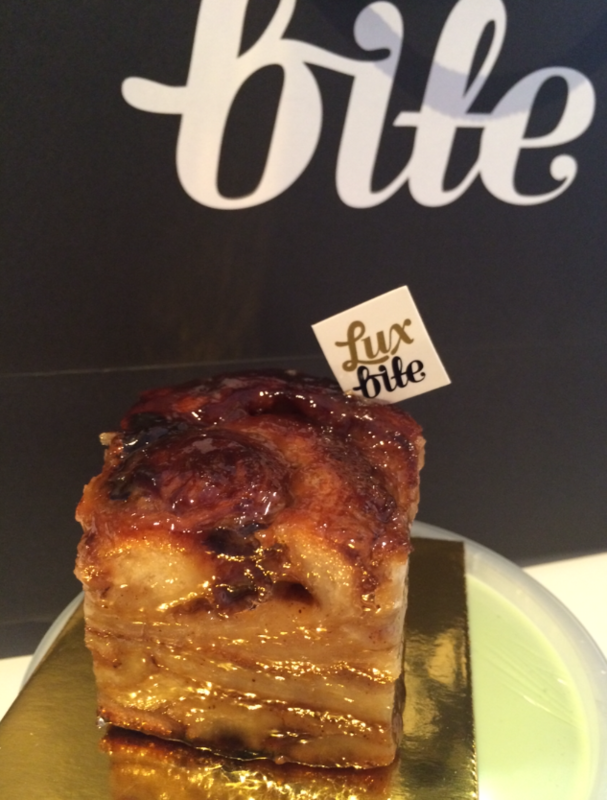 The little glazed square of bread and butter pudding was eaten warm with a generous amount of pandan anglaise which was absolutely delicious. The pudding was soft and had a nice cinnamon flavour, which went perfectly with the pandan englise. The pandan englaise had the perfect amount of pandan, it was superb. The green coloured custard was heavenly. I could have seriously eaten a whole river of the pandan englaise. Augustus save some for later. The caramel cravings cake is for the caramel lovers out there. 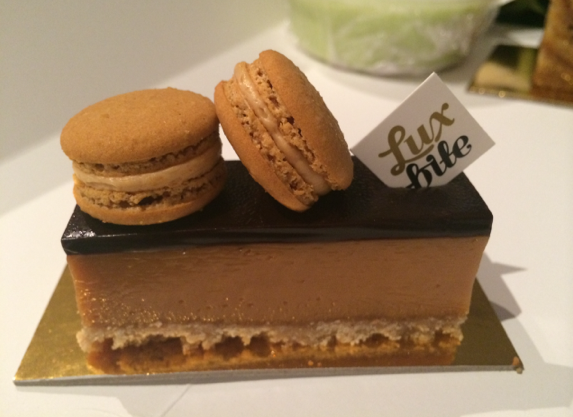 It was a slab of delicious caramel between a layer of chocolate and a coconut base with two teeny-weeny salted caramel macarons on top (so cute). This looked incredibly decadent at first sight but you can actually get through the whole mini cake without it being way too sweet. It was basically a caramel slice, but a really delicious one at that. The staff are friendly, kind and just really lovely. It’s definitely a place that you will visit time and time again. In fact we got some takeaway cakes last night. I left my bread and butter pudding on the table (my mistake) and when I wasn’t looking that little sneak Max jumped up on the coffee table and got his mitts on it. I was completely devastated and was left to drown my sorrow in the pandan englaise that remained. Drinking the pandan on its own spawned a brilliant idea. What about a pandan milkshake? I would love it if Luxbite made a panda milkshake! Now that would be pretty awesome. 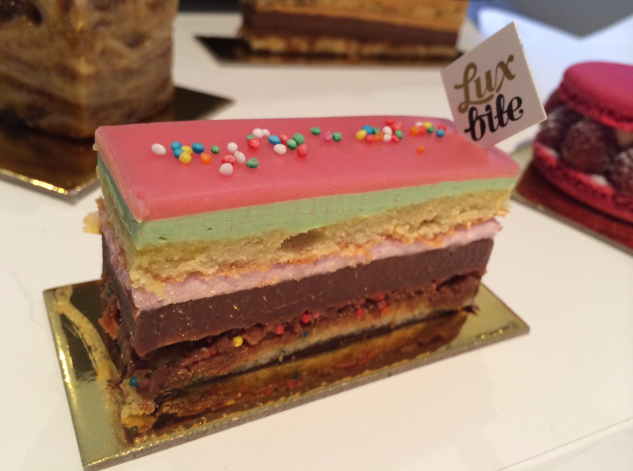 The desserts at Luxbite are inventive and are a beautiful expression of their love for food. Any sweet tooths dream come true.